Trump fires acting attorney general: "betrayed"
In a stunning turn in a four-day drama that has defined his young presidency, President Trump, at 9:16 p.m. Monday, announced the firing of the acting attorney general who had defied him on his migrant-travel ban, saying she "has betrayed the Department of Justice." Until the confirmation of Jeff Sessions as attorney general, Trump named Dana J. Boente, a 31-year Justice Department veteran, as acting A.G.
Boente was sworn in within an hour of the announcement, AP reported. 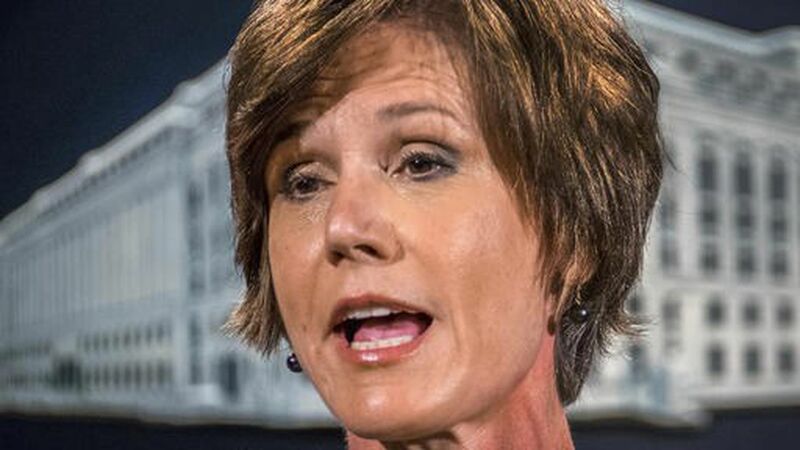 Why Trump acted: Sally Yates, an Obama holdover, late Monday had ordered the Justice Department not to defend his controversial executive order imposing a 90-day ban on entry to the US. by citizens of seven predominantly Muslim countries. What Yates wrote in a letter to department lawyers: "I am not convinced that the defense of the Executive Order is consistent with these responsibilities nor am I convinced that the Executive Order is lawful." The backdrop: The speed and severity of Trump's measure, which he calls the simple enactment of a signature campaign promise, has been criticized by some CEOs, Republican lawmakers and crucial allies, and prompted massive weekend demonstrations at airports around the country. The successor: Boente was nominated by President Obama in 2015 to be U.S. Attorney for the Eastern District of Virginia, based in Alexandria. Boente is a graduate of St. Louis University and its law school, and has lived in Northern Virginia for 29 years, according to his official bio. We can't stress this enough: Watch closely the specific, substantive moves of the Trump White House. Try to block out the white noise of outlandish statements and unforced errors, and the hyperventilating they provoke. This is more a bulldozer than a runaway train. Update: Boente canceled Yates' earlier order.